This week, I’m trying to reduce my food spending by kicking my restaurant habit and cooking at home. I’m aiming to shell out no more than $60 on food all week. The rules: Stuff I already have in my pantry (olive oil, red wine vinegar, etc.) is fair game and doesn’t count toward my overall spending. I’m not allowed to throw anything away. My inspiration in all this is chef and author Tamar Adler, who has mastered the art of what she calls “catching your own tail”: transforming whatever odds and ends your pantry has to offer into deeply satisfying meals. Read my interview with her here. Tuesday, January 31, 2012: My week of food-spending challenge is over, and I’ve had a few days to reflect on the results: six days and nights of cooking at home (except for a few cheats: two cafe hot chocolates, lunch out with a few coworkers, and one takeout Indian dinner, when I was coming down with something and not feeling up to cooking) for a grand total of $51—$9 under my goal of $60 for the week, and less than a third of the amount that I spent when I tracked my food spending for a week back in December. I was less successful in my attempt to waste nothing; as I mentioned in my last post, plastic baggies, twist ties, and cellophane got the better of me more than once. But I didn’t waste anything edible. Not bad, considering restaurants throw away a lot, as much as 20 percent of all their food, by some estimates. I hope to keep up this trend in the future, especially where animal products are concerned: Last year, the Environmental Working Group found that food waste accounts for 20 percent of the emissions associated with the production and consumption of meat and dairy products. So will I keep up my restaurant boycott now that I’m done? Probably not entirely. To be honest, I’d miss my neighborhood eateries too much. At most of those places, I don’t feel too bad about occasionally splurging—I consider it a delicious way to support local business. So: Going forward, I’m going to aim to take what I’ve learned—from Tamar Adler and from my own experiments this week—and cook the majority of my meals at home. First up: this spicy soup recipe from MoJo food and ag blogger Tom Philpott. Friday, January 27, 2012: Sometimes when the train takes forever, they tell you why, and you understand and forgive them. And sometimes, you sit in the tunnel for what seems like an eternity with no explanation. Everyone slowly becomes sort of pissed, and by the time you get off the train, there is practically a stampede up the escalator at the station. The latter happened last night, and by the time I finally got home, I was in no mood to cook. I had finally made it through my leftovers from my feast a few nights ago, so I peered into my fridge to consider my options. Steamed cauliflower and the rest of my steemed beet greens do not a dinner make, I thought to myself, my crankiness level intensifying by the moment. Then I remembered my eggs. My chickens have been laying up a storm lately, so I had plenty of fresh eggs to choose from, of all sizes and colors ranging from pale green to rich brown. A plan began to form in my mind. I sliced up a shallot and sauteed it with my beet greens in olive oil. In a separate pan, I warmed some of the steamed cauliflower with a little water. I selected two eggs and whipped them in a little bowl with salt and pepper. 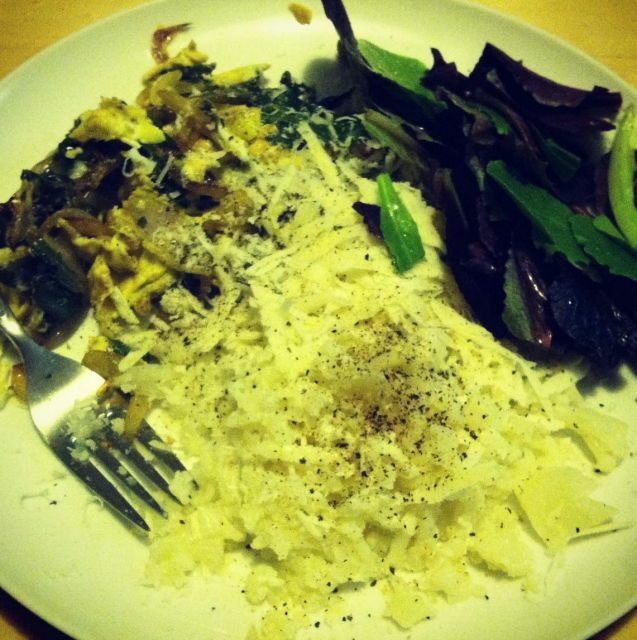 Once the shallots and beet greens had cooked for a few minutes, I added the eggs and scrambled the whole mess of it. By that time, the cauliflower was warm, so I mashed it up. I washed some lettuce, and put the scramble and cauliflower in separate little heaps on the plate. Then, I used a trick Tamar recommends for a good three-quarters of the recipes in her book: I grated fresh parmesan over the whole thing. A lot of it. I added some freshly ground pepper, and called it an egg dinner. I timed the preparation of this meal—the whole thing took eight minutes, start to finish. And it was incredibly satisfying. I ate the creamy cauliflower and eggs first, then I poured some champagne vinegar over the lettuce and called it a salad. By the time I was done, my train ride was a distant memory. I really couldn’t believe how quickly this meal came together—and even more impressively, cured my crankiness. A note about waste: I’ve been doing a good job of not throwing any actual food away, and I’ve been washing a few plastic bags here and there. But I admit to tossing plastic wrap from the parmesan tonight, that film thingy that comes on top of yogurt, and a few other annoying plastic odds and ends. If you have tips for avoiding this kind of plastic in the first place, leave ’em in the comments. Thursday, January 26, 2012: Since I’m still working my way through the mountains of lentils, curry, rice, and tandoori cauliflower I made for myself two nights ago, I thought I’d write a little today about how I’ve been doing this week with non-lunch-and-dinner food: coffee, breakfast, and snacks. Breakfast isn’t too hard at all, since my habits haven’t had to change: I generally eat oatmeal from a big cannister that I keep at work. Coffee, though, is another story. With a cafe a block away from my house and another one downstairs from Mother Jones HQ, it’s almost impossible for me to resist the call of the $1.75 takeout joe, paper cup and all. But this week, my friend lent me an individual French press, which I’ve been using to make coffee at my desk. The coffee itself is comparable in quality to the stuff I get at my cafes, and it’s actually sort of fun and satisfying to use the French press. As I mentioned on Tuesday, though, when I wanted hot chocolate, I caved and hit the cafe. It’s harder to make that at work. For snacks, I’ve been working my way through the apples, yogurt, and chocolate I bought during my big initial shopping. I’ve also had some ice cream, brought to me by friends. During my shopping, I considered adding a pint of ice cream to my haul, but then I thought it probably wouldn’t kill me to lay off the Ben & Jerry’s for a week. As it turned out, my enabling friends provided my fix. I chopped up my cauliflower, and decided to steam half of it plain and roast the other half with tandoori spice. My tandoori recipe—which I learned from some people I had brunch with a few weeks ago—is really easy: Just coat your veggies with tandoori spice, yogurt, and lemon, and roast at about 450 degrees for 45 minutes or so. I realized I had left my yogurt at work, but I had some buttermilk leftover from cookies I made last week, so I decided to give it a whirl. While half the cauliflower was roasting and the other half was steaming, I started some rice. Some salad. I put some lettuce on a plate. Miraculously, everything finished cooking within about 10 minutes. At that very moment, my roommate got home. I implored him to help me eat the mountains of food I had made for myself. He humored me. I piled a little of each dish on my plate next to the lettuce. The verdict: Not bad! The tandoori cauliflower was tender and tangy, and the curry fragrant with fresh ginger, weird improvised sauce and all. The dal was smooth and comforting, if not a little oversalted. The one problem was that I hardly made a dent in the heaps of food I made. Here’s hoping I don’t tire of these flavors anytime soon. I know it’s more sensible to cook everything without spices, then add the flavors later. But this time I got carried away. I blame the deliciousness of ginger and tandoori spice. And another confession: Remember those beans that I soaked for 32 hours then cooked? It turns out I, uh, don’t really like them. They turned out too mushy and a little sour. Unless anyone has any brilliant ideas for how to disguise them to the point that they don’t taste like themselves, they’re on their way to becoming chicken feed. 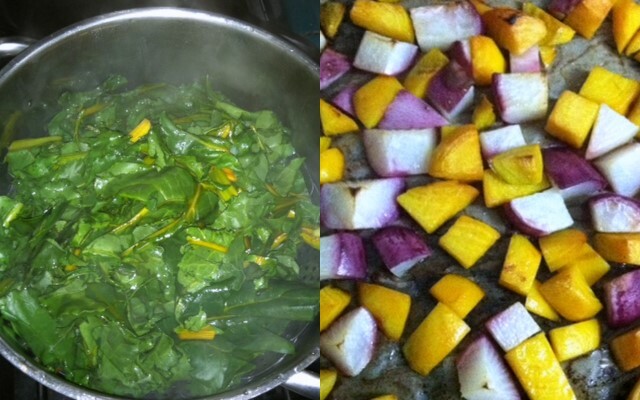 Okay, last thing for today: If you’re craving more food-spending tidbits, you really should read this post by my colleague Tasneem Raja on why spinach is a good economic indicator. Tuesday, January 24, 2012: I wasn’t quite sure how I would handle dinner last night, since a friend and I were going to another friend’s house to play music. We usually pick up Thai food before our weekly jams, since all of us come straight from work, and we like to use our two-ish hours for music playing, not cooking. But my friends gamely agreed to indulge my food-budget experiment, so I told them I’d bring over some ingredients. Yesterday morning I ran around my kitchen fretting about what ingredients to take, eventually settling on my bunch of kale, a shallot, some parmesan, and the tail-ends of two boxes of pasta, each of which was supposed to cook for a different amount of time. I left the house feeling harried and apprehensive, envisioning way-too-al-dente gemelli comingling with mushy rotini under a Spartan kind of leafy sauce. But much to my relief, the meal came together surprisingly well. We started cooking the gemelli in boiling water with plenty of salt and olive oil, then dumped the rotini in five minutes later. Meanwhile, my friend sauteed my kale and shallots, along with some cauliflower and leaks that my other friend happened to have in her fridge. We loosened the “sauce” with some water from the pasta, then served the whole thing with lots of parmesan. My friend was out of black pepper, so we used white pepper instead, a revelation—it gave the dish a sort of a white-sauce flavor. And the texture of the pasta was just fine—it hadn’t seemed to suffer for its fraternizing. The whole affair took less than half an hour. Next up: Lunch today. After band practice last night I finally managed to cook my beans, about a cup of which I threw together with some chopped garlic, olive oil, and parseley. I scooped those and some of my dwindling supply of roasted root vegetables over lettuce, threw it all in a tupperware, and called it salad. We’ll see how it tastes. And one confession: I got a takeout hot chocolate this morning from the bakery for $2.25. It was delicious. The cheese could have been a little meltier, but overall it was a very satisfying lunch, with the sweet nuttiness of the roasted roots offset by the saltiness of the cheese and the tang of the greens. Your shopping and cooking looks so right on track. I’m particularly proud of your beet green use. One thing, regarding a good loaf of French bread. It is precisely good bread’s staling propensities that make it so useful. Fresh, it’s great for whatever you’re going to do with English muffins. But where English muffins’ uses start and stop at their muffin-ness, stale bread is a salad ingredient–the croutons you quickly make, following instructions in my book, or any other one that makes it seem easy, turn just a cup of your roasted vegetables into bread salad, and there you go, lunch or dinner–or a soup ingredient–your bean broth, stale bread, some beans, olive oil. Or bread crumbs, which are all you need for delicious pasta with herbs, olive oil, garlic, and bread crumbs. I stood there in the market staring at a loaf of French bread, thinking, Tamar would totally buy this instead of packaged English muffins, but I couldn’t recall the details. 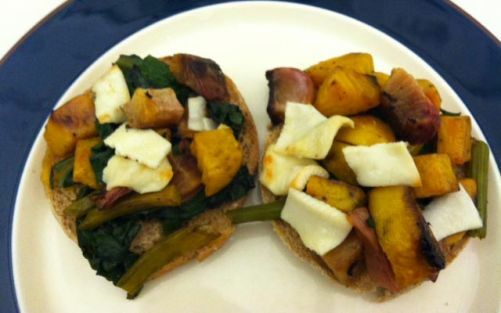 Good ideas on how to turn the stale bread into something useful. But I still want a slice of bread every day, and in my experience fresh bread becomes unslice-ably hard after about two days. Do you recommend pre-slicing some of it and freezing it? I do slice and freeze some bread, always. I sometimes leave half a loaf out, and feel European and perfect for a day. Then I’m pleased with my European perfection and slice the rest of it and freeze it in a few packages. More often I just go ahead and slice nearly all of it. So next time: French bread it is. …for a grand total of $33.28 (including the five-cent bag credit). Not bad! Especially considering all the produce is organic, and most was grown in California. The big-ticket item turned out to be the yogurt, which I could have made myself for the price of a pint of milk. Next time. I mostly avoided packaged items with long lists of ingredients, with the exception of the English muffins. I’m guessing that a Tamar-approved substitution would be a really good loaf of French bread, but I can never seem to manage to keep fresh bread around for long enough without it getting stale. Of course, shopping was the easy part. Having learned from Tamar that the key to preventing too-tired-to-cook syndrome is to prepare food in advance so it’ll be handy when I need them, I put some of my dried beans in a big poat of water to soak. 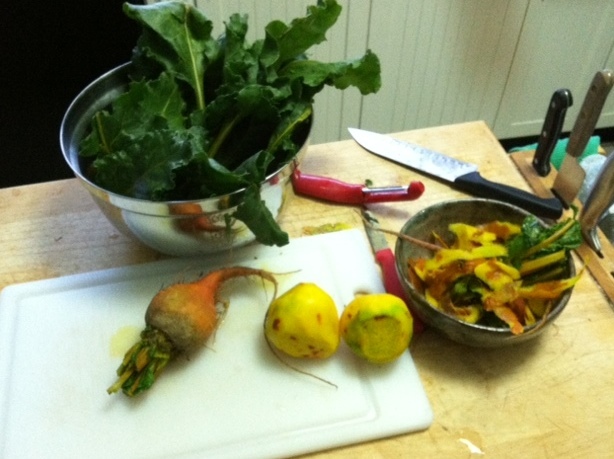 Then I set about cutting up my beets and turnip, saving the beet greens for me and the peels for my chickens. Well, okay. Organic and local though the fruits of my labor are, they are significantly less appetizing than the pad see ew from my favorite Thai place…so far! 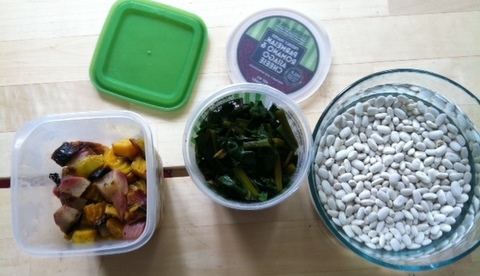 On Tuesday, read about my first attempt at making the contents of these three humble tupperwares into something edible. January 13, 2012: So here’s something embarrassing I recently learned about myself: I personally spend about 40 percent more than the average American household every week on food. And I’m talking about just me. One person. No kids to support. I swear I am not a glutton. I eat quick oats from a big Quaker canister every day for breakfast. My lunches are pretty modest. Just a salad or a sandwich. For dinner, maybe two slices of pizza. (My most excessive habit is probably dessert, which often consists of a bowl of ice cream that is not, by any stretch of the imagination, a sensible portion.) I’m also not a foodie. Despite having lived in the Bay Area for four years, I still haven’t learned to hate Subway or tell the difference between fresh, artisenal pasta and Prince spaghetti from a box. Given my relatively normal eating habits, you might wonder how I manage to rack up such an outsized food tab. The answer is simple: I am really, really good at making excuses for not cooking. Making a meal, I say to myself, would take forever, and I’m hungry now. My kitchen is too messy; I don’t even know where the damn cutting board is. Whatever I make isn’t going to be as good as the Thai takeout I’m craving. I really need to catch up with my friend so-and-so; we should just meet up for dinner. And so on. Pretty soon I’m dining out four nights a week. Not like a big fancy meal every time; often it’s just a burrito. But it adds up. I had suspected that my food spending was out of control for a while, but it was only when my colleague Tasneem Raja and I commiserated over our exorbitant grocery budgets that I decided to actually track it. I kept a diary for a week, dutifully noting every last takeout coffee, plastic-wrapped sandwich, and order of samosas. The results were, well, mortifying. As usual, I purchased lunch four out of five days, and ate dinner at a restaurant or got takeout four evenings. My grand total for the week: $168.63. And that’s not even including alcohol. According to the Bureau of Labor Statistics, in 2010 the average American household spent $117.87 per week on food. Ouch. Okay, but next time, try not making it all vegetables and tofu with miso sauce—which you’ll get sick of—but just cooking each vegetable well, or few together, roasted or boiled or sautéed. So if you want them with miso sauce and tofu one night, you can, but if you want Tuscan beans with lots of bread and olive oil the next, you can stir your vegetables into that. 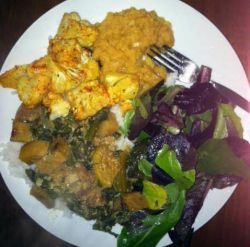 The components make it impossible to get leftovers fatigue, where a whole meal, with its characteristic spicing, and its being sort of stuck in the culture it comes from, is easier to get sick of. Imagine instead if you could make a Japanese meal, or an Italian meal—some of the vegetables with pasta—or a French meal—pureed with a cooked potato and stock into soup—or a Thai one—adding some toasted rice, ground up, and lots of cilantro and chili and fresh shallots. Doesn’t she make it sound easy? Anyway, next week, I’m aiming to spend no more than $60 on food. The rules, which I made up myself, somewhat arbitrarily: Stuff I already have in my pantry (olive oil, red wine vinegar, etc.) is fair game and doesn’t count toward my overall spending. I’m also not allowed to throw anything away. Using my food scraps will be pretty easy, as I’m lucky enough to have eight chickens who happily devour vegetable ends and table scraps like small, clucking garbage disposals. It’ll be harder, though, to avoid packaging that can’t be composted or recycled. Commenters, I know what you’re thinking: If my biggest problem is that I eat too many delightful meals at restaurants, then I should seriously quit whining. You’re basically right. I’m the first to admit that this is a first-world problem of the first degree. I’m not going to solve hunger by spending less on food, and I’m certainly in a better position than some to give up takeout, considering that I live near a bunch of great grocery stores, and I only have to cook for me, not a whole family. Nevertheless, I’m irked by the fact that I’ve come to expect food to appear before me like magic. As Mother Jones food and ag blogger Tom Philpott points out every day, food does come from somewhere. And though the environmental and social impacts of our food system are massive, they’re easier to ignore when someone else is preparing your food. If I go to a restaurant, I’m probably not going to ask whether the organic tomatoes on the salad are sucking Mexico dry a la this Portlandia sketch. But it’s pretty easy to pass them up in the supermarket produce aisle or the farmers market. Meanwhile, my colleague Tasneem, who has been through the dark tunnel of reducing her food spending and come out the other side completely reformed, will be blogging about food spending trends in the US. Keep your eyes peeled for some cool features,* including a calculator that will let you compare your own food spending to local and national averages. If you have any tips for stretching food dollars, leave them in the comments. And wish me luck! *Update (January 15, 2012): About those cool features: They’re going to be even cooler if we let them cook for another week. Stay tuned!